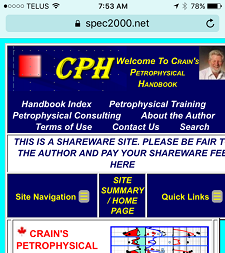 Crain’s Petrophysical Handbook is now "Mobile Friendly". The website has been updated to improve viewing and navigation on mobile devices (smart phones, tablets) as well as desktop computers and laptops with a narrower viewing area. The website adapts its layout to the viewing area by changing the left and right navigation panes into pull down menus, altering page scrolling behavior, as well as scaling images down when appropriate. Please contact us should you have any questions. Thanks for your continued support! STEP 1: On your mobile device open Safari or another website browsing application. The following instructions will use Safari but other website applications should have similar functionality. See Figure 1. 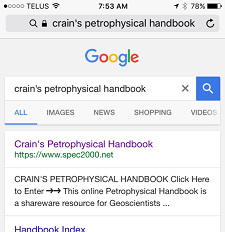 STEP 2: Once Safari is open, you can search for the website by typing in “Crain’s Petrophysical Handbook”. See Figure 2. 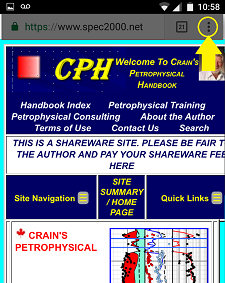 Either way should bring you to Crain’s Petrophysical Handbook home page. See Figure 3. STEP 3: Before continuing, you may select another CPH page as the landing page for the App. Touch "Site Navigation" to choose the desired page, for example "Handbook Index / Site Map". 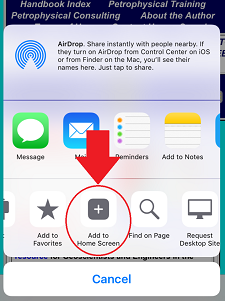 STEP 4: Along the bottom of your mobile device, look for the Share button and press it. See Figure 4.
button by swiping left the lower row of buttons just above the Cancel button. 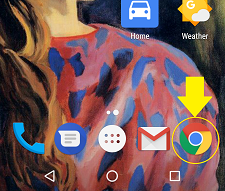 Stop when you see the “Add to Home Screen” button and press it. See Figure 5. STEP 6: Next, you will be asked to confirm the addition by selecting “Add” in the upper right of your device screen. 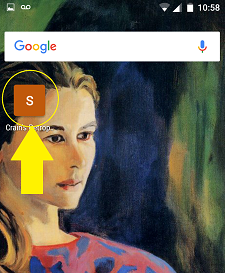 STEP 7: You may also edit the first line of text to change the name of the App. See Figure 6. Your device will add a new App to the first available space on your home screen or another screen depending upon on how many Apps are installed on your device. 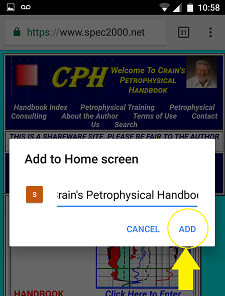 You may need to swipe to another screen to see the newly created “Crain’s Petrophysical Handbook App”. See Figure 7. Congratulations, CPH is now one touch closer! 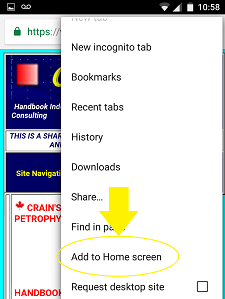 STEP 1: On your device open Chrome or another website browsing application. The following instructions will use Chrome but other website applications should have similar functionality. See Figure 8. 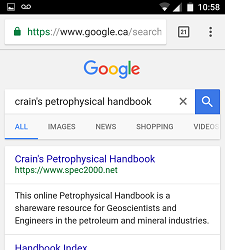 STEP 2: Once Chrome is open, you can search for the website by typing in “Crain’s Petrophysical Handbook”. See Figure 9. Either way should bring you to Crain’s Petrophysical Handbook home page. See Figure 10. STEP 5: Next, you will be asked to confirm the addition by selecting “Add” in the lower right of the pop-up window. 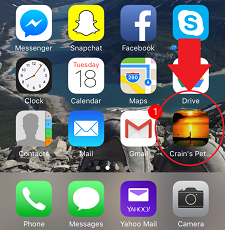 STEP 6: You may also edit the text to change the name of the App. See Figure 12. 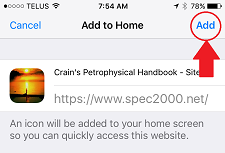 You may need to swipe to another screen to see the newly created “Crain’s Petrophysical Handbook App”. See Figure 13.